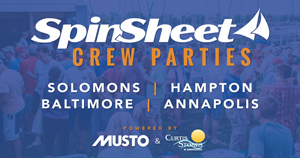 Sixty-four teams representing Canada, The Netherlands, South Africa, and the USA battled the current, and each other, on the inaugural day of the J/22 World Championship hosted by Annapolis Yacht Club in Maryland. Four races were completed, all won by Annapolis teams, led by 2013 J/22 World Champion Allan Terhune on Thunder Chicken, who recorded scores of 4,6,1,2 for 13 points. 2016 J/22 World Champion Mike Marshall’s Bad News started with a 13 but added a solid 3,4,3 to claim second place with 23 points. Annapolis sailor Zeke Horowitz’s Uncle Fluffy’s 11th in Tuesday’s final contest added to a count of 6,1,6 for 24 points and third position. 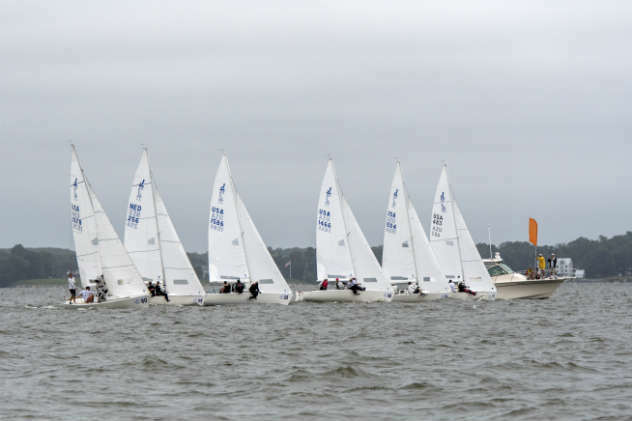 Following a postponement while the fog subsided on the Chesapeake Bay, racing got underway in 6-8 knots as local Jeffrey Todd’s Hot Toddy opened the Championship with a win. Travis Odenbach’s HoneyBadger and Christopher Doyle’s The Jug 4 1 followed in the top three. Horowitz gained the second victory, pursued by Pat Curran’s Alzo and Marshall. While winds worked their way up to about 10 knots, Terhune earned the next bullet, chased by fellow Annapolis YC member J.R. Maxwell’s Scooby and Odenbach. Brad Julian’s USA677 was able to lead the fleet back to shore after race four, with Terhune and Marshall. Racing is scheduled through Friday. Find SpinSheet photos by Al Schreitmueller here. Find more about the J/22 Worlds here.